“The story of my tents as they relate to campsites, however, started with the TREETENTS which were originally designed for the ROAD ALERT GROUP in ENGLAND. This group of activists fight against the excessive constructing of highways through forests. During their protest they cover themselves and hide and live in the trees to fight as long as possible against the rushing violence of the chain sawers. 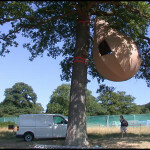 The TREETENTS would provide a comfortable place for them to stay during their habitation of the forest and prevent the trees from being cut down. 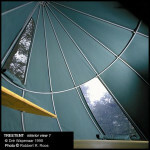 Even though I designed the tents for use by the ROAD ALERT GROUP the project never happened. Before I finished it, a representative from a campsite saw the drawings of the TREETENTS and convinced me to sell them this project. 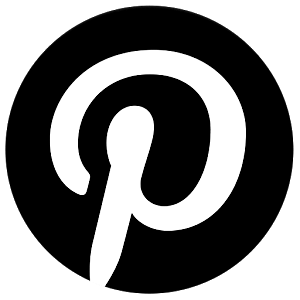 It was a huge success; and is still in use today. They are rented 5 months out of the year. Two adults and two children can sleep on the main floor which is about 9 feet in diameter. 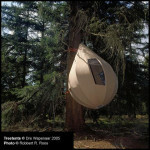 The form for these tents naturally developed itself, when I hung a circular platform with a rope on the side of a tree. 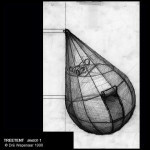 My inspiration for the shape was not the dewdrop. 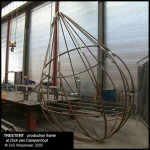 Now it’s just use as sculpture and they are not commercial produced tent, as we can read from Studio Drè Wapenaar‘s website. 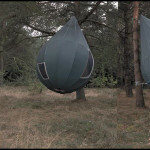 I think it would be great to sleep in these special tents, maybe one day the designer will change his mind! 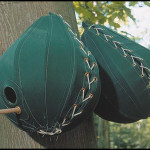 At the moment they started producing the treetent for birds!